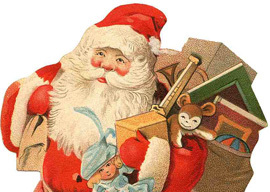 A perennial golden nugget of maudlin Christmas fare is the famous 1897 editorial in The New York Sun where an omniscient editor reassures an eight-year-old girl that “Yes, Virginia, there is a Santa Claus.” Little Virginia’s rowdier kiddie friends had planted doubts in her mind, but the noble newsman reassured Ginny that her playpals were wrong and that yes, for Christ’s sake, don’t be silly, get a grip, what are you, meshuga?—of course Santa Claus exists! Now be a good girl and go do your homework! For over a century this story has been cherished as tear-jerking, heartwarming, and, even without Viagra, uplifting. But wiping all the sentimental window frost away, it actually celebrates an adult journalist lying to an inquisitive child. It was a ridiculous lie, too, one positing that over the course of a single night, some suspiciously jolly white-whiskered chubster mercilessly slave-whips eight tiny (and non-unionized) reindeer across the globe to jam his jelly belly down two billion or so chimneys and deliver twenty million tons of toys to tots.